Most all machines need some type of aftermarket volume control. 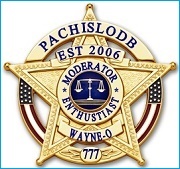 Topic: We are Alive and Well here at PachisloDB! It appears the machine you have pictured is a Certain Victory machine and not a Golden Temple. I'm not sure what you are referring to, but I'm guess you want to switch from cash mode to credit mode. Here is link that explains how to switch your machine. If you are ever in the Indianapolis area, I could sell you 3 or 4. How many quarters?, Older machine? What could you be insinuating?